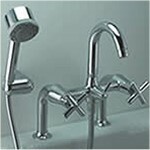 Marflow Engineering Limited is one of the few bathroom companies that continue to design and manufacture in the UK . The company has been established since 1968 and has developed an enviable reputation for excellence in design, innovation and service. Marflow’s primary market place is the retail bathroom specialist that consults, designs and supplies quality bathrooms. A wide range of products for both contemporary and traditional markets is available. 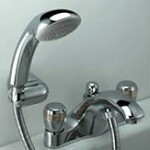 These include, showers, taps, mixers and accessories. The products shown below are only a selection of the full range available from Newport Bathroom Centre so please telephone us on 01633 262629 for our latest brochures, prices and offers. Marflow Trident Range features Single lever showers and mixers with sleek, modern styling reflecting the demands of modern bathroom designs. Incorporating ceramic disc technology for smooth, maintenance free operation. 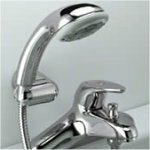 St James is a traditional style range of taps and mixers with 3 handle options: England - Flat X; London - Round X; or Lever Handle (shown right), all incorporate ¼ Turn Ceramic Disc technology. The St. James Collection is available in hand polished brass, finished in either chrome, antique gold or bright nickel, all with fine English porcelain. The strong lines and style of Tangent are based on its essentially cylindrical form with unconventional shapes. The assymmetric style and tangential concept has created a high quality design enabling the bathroom to be a leisure space that is both aesthetic and functional. 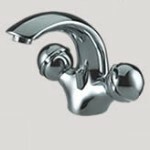 Tangent taps are available with either a single bar or 4 bar X(shown right) head. 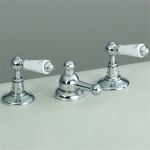 The regal connotations of the Sovereign name are truly reflected in the opulent design of these taps and mixers. The effect of the combination handle rings is truly magnificent. Utilising ceramic disc technology for maintenance-free operation. 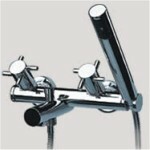 An elegantly designed range of taps and mixers, Geni incorporates smooth domed handles as a feature. A choice of three ring options, chrome, satin and gold provide the user with that hint of individuality. Utilising ceramic disc technology for maintenance-free operation. Combine elegant styling with refreshing clean lines to provide visual simplicity. The bright chrome finish only serves to enhance this design. Utilising ceramic disc technology for maintenance-free operation.